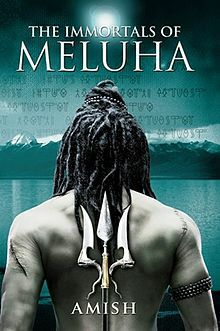 I have just finished reading “Immortals of Meluha” and I could not stop myself of writing a review about the Book. It’s my first ever Mythological read, though not entirely “God” focused, still rendering the subject and theme well to that area. I am not a religious person, at all. Hence when my friend asked me to read the book after Io had just finished “Fifty Shades Of Grey” Trilogy (no review for that one.. didn’t like it much ), I was not that sure. But to keep her sentiments at par, I agreed for that. The most I could do was to carry the book in front of her a few times and then return it with much ado. But the moment I lifted the book up, I was hooked to it. Surprisingly, I found myself quite interested in the life and lifestyle of Shiva, the Human..
For more information on the book and the author, visit Wiki’s Page here. Have another look at the Official Youtube trailer for the book here. I have been reading English Novels (both by Indian and International Authors ) over almost 10 years now and my average speed is one book per week. I have observed that most of the Indian writers revolve their stories on Adultery or similar Relationship issues these days. Which is fine to write about, keeping in mind the new “open” relationship status setting foot in India these days. But the Geek reading community was reduced to shocked horror at the new low that Indian writing had sunk to. Taken in that context, this work by Amish should come as a whiff of fresh air. This novel deviates from the normally trodden path of B-schools and romance and college damsels. Neither is this a mythological discourse where apsaras dance and impress meditating sages nor is this a documentary like stuff praising the lord. Giving credit where due, I must admit that the storyline has been well conceptualised and that considerable amount of research has gone into this book. The concept of portraying Lord Shiva as a common man living in the mountains may hurt some sentiments, but the plot and narration is really appreciable. The book has a certain enduring power that makes you keep turning the page. The simplicity of the language is excellent yet there is a certain elegance in the lingo. There were times when I cringed because Shiva’s character seemed to speak like ‘the guy next door’ and I wondered whether that could be even remotely possible. But if the author’s purpose was to connect Lord Shiva’s story to the youths of today, then I’d say it’s worth the try. Although I must add on, that words like “Damnit” don’t reflect a very “godly” image. Amish should have taken care of this little detail. For me, it was fun, but for some it might be offensive. But there were layers of detailing that I particularly admire in this book. For instance, Daksha’s manipulation of Shiva’s soft corner for the beautiful Princess Sati. Even the way Shiva’s non-hierarchical mindset works, the way he treats others beneath and above him with tremendous dignity and sense of equality – these are typically not qualities that we learn to associate with the Shiva concept at first instance. Also, he has endless questions about everything and a scientific, logical approach to problem solving, which convey to us more about his personality. His glory and magnificence have been more austere than anything else but in this book, there’s a courageous warrior we are introduced to but one who is deeply in love and yet the epitome of all that a woman would want in one who loves her and wants to woo her. The rough looking Shiva fools us because in love, he is gentle, caring, and compassionate and yes, most devoted to winning the heart of the beautiful woman he loves. A very rare side of Lord Shiva, which am sure every reader would enjoy. But still, somewhere the book lacks humour, has an out of the world language at some places (a poor imitation of some Western works), maintains pace at most junctures, and worst of all.. leaves the questions unanswered at the end. I don’t like such endings. Though it enhances the excitement of holding the next read in line, but at the same time.. It could have been handled in a more subtle way. He could have answered the questions raised in this book here, and raised new questions in the sequel. All in all, a fairly Good read.. not exactly a page turner at some points.. But an average Metropolitan reader like me would surely love the storyline and the references given. The author has tried something brave and different which makes it a must read on the go. I have both Immortals of Meluha and Secret of the Nagas. Am eagerly waiting for the last- Oath of the Vayuputras. I liked the flow of logic in the book. What I mean is , we never question anything. for ex: Shiva chops off Ganesha’s head, replaces it with an elephants head and breathes life into him. or Kunti chants 4 different ‘mantras’ and is ‘granted’ a child… hello people! we all know how that works, don’t we? Hi Nupur, I followed your comment on my blog and pleasantly surprised to find a book review here, made my day :-). I am actually trying to get my hands on this book for a while now. Thanks for stopping by at sattvaa. I could not stop reading both the books and so eargerly waiting for the 3rd one .. its so well written actually amkes Mythology interesting!